How Good Are Your Balancing Skills?? This Will Test Your Skill And Nerves!! Remember playing Jenga as a child? 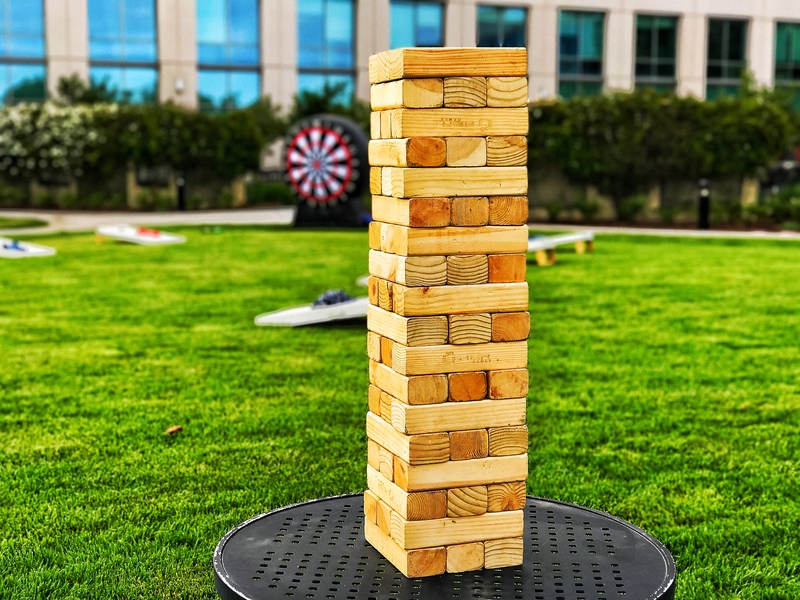 Our Giant Jenga Tumbling Tower Game Rental will keep your guests in suspense as they watch others compete to see who will make the tower come tumbling down. 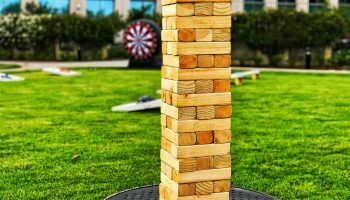 This Giant Jenga Tumbling Tower Game Rental is one of the easiest games to play and is appropriate for almost any age ( 4-99). 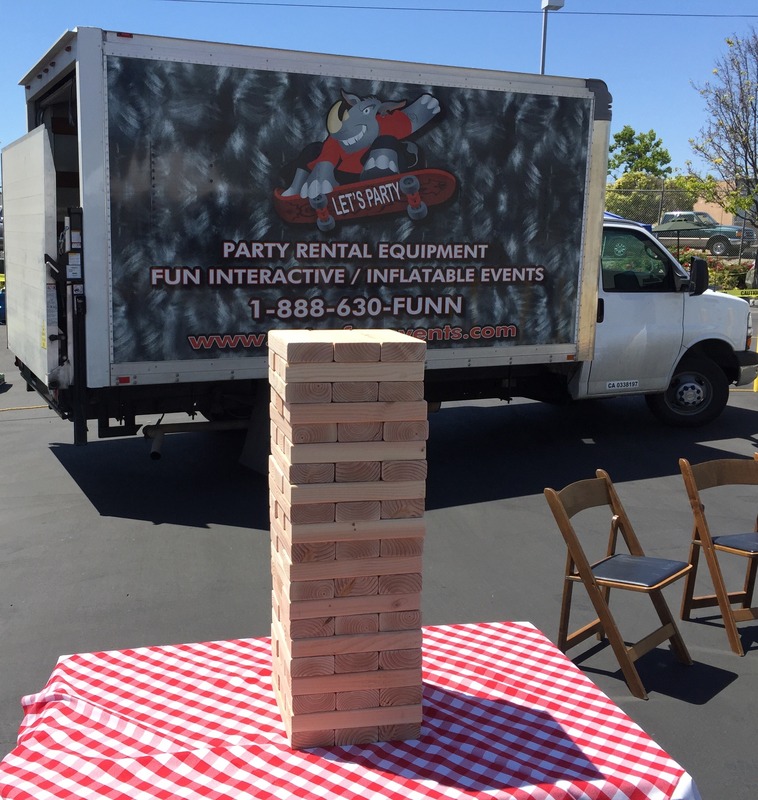 The Giant Jenga Tumbling Tower Game Rental is a great ice breaker at any company event or great entertainment for your backyard party. We supply everything you would need to play including the table (extra 8.00). This is a great tournament style game. 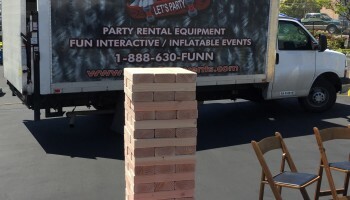 Once the Giant Jenga game is built, the person who built the tower moves first. 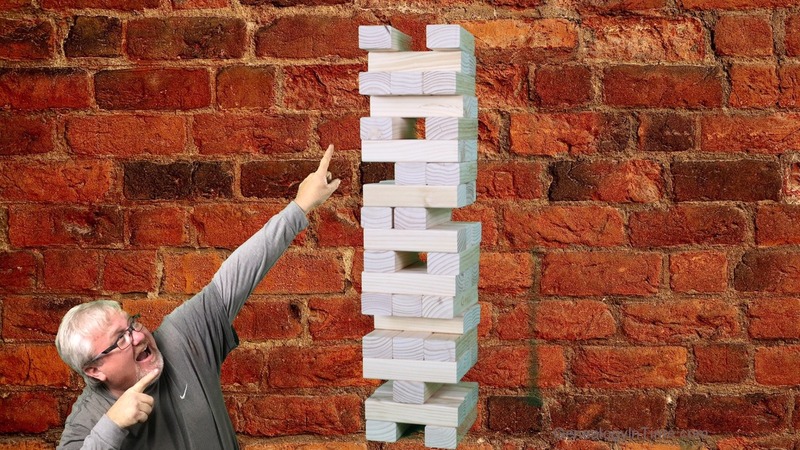 Playing Giant Jenga consists of taking one (and only one) block from any story (except the completed top story of the tower) at the time of the turn, and placing it on the top most story in order to complete it. Only one hand at a time may be used to remove a block; both hands can be used, but only one hand may be on the tower at a time. Blocks may be bumped to find a loose block that will not disturb the rest of the tower. Any block that is moved out of place may be left out of place if it is determined that it will knock the tower over if it is removed. The turn ends when the next person to move touches the tower, although he or she can wait 10 seconds before moving for the previous turn to end if they believe the tower will fall in that time. 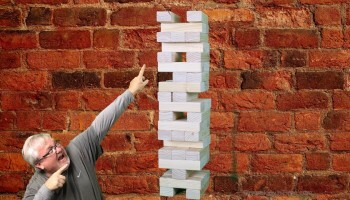 The game ends when the tower falls in any significant way — in other words, any piece falls from the tower, other than the piece being knocked out to move to the top. The loser is the person who made the Giant Jenga fall. The winner is the person who moved before the loser. Read our tips on beating anyone at Jenga!